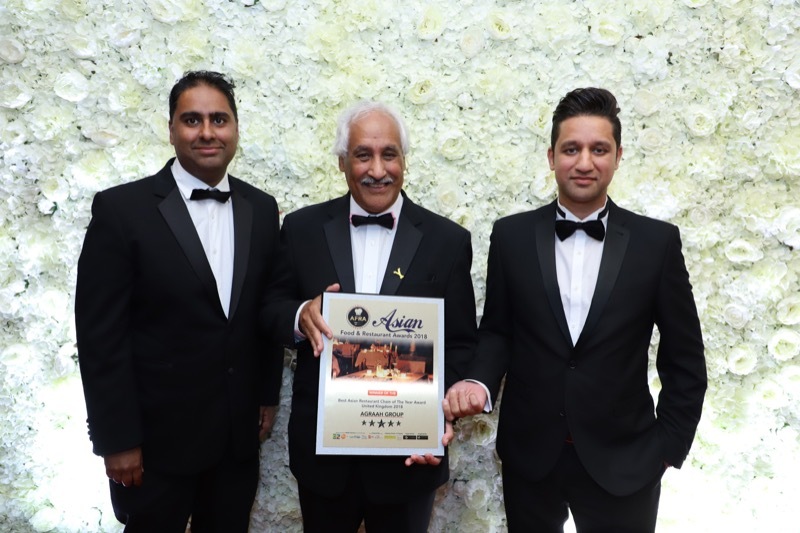 The Aagrah Restaurant Group won the coveted Best Asian Restaurant Chain United Kingdom Award at the Asian Food and Restaurant Awards (AFRA) at the Millennium Gloucester Hotel, London. The awards, in their inaugural year, aim to recognise and celebrate the standout Indian restaurant operators across the growing multi-billion pound dining sector. Only the best, most innovative and creative chefs and restaurants get a shot at the title and an award that opens doors to future success. Accepting the award Aagrah Managing Director, Mr. Mohammed Aslam, MBE, DL, commented: “By continuing to get our chefs to embrace creativity, not only do we to create a unique dining experience but we also ensure that modern curry cuisine continues to evolve. It is a great honour for Aagrah Group to receive this United Kingdom title”. Aagrah celebrates 41 years in business this year. The company has twelve restaurants across Yorkshire, a purpose built conference and banqueting centre, The Midpoint Suite, Pudsey, seating 450, an outdoor catering unit, catering for up to 5000 people nationally. The Aagrah group also enjoys a share of the home dining market through their range of authentic tarka cooking sauces available in supermarkets. Many of the sauces from the range have won The Guild of Fine Food Great Taste award. These awards are the world’s largest and most trusted food and drink awards. Asian Food and Restaurant Awards pays homage to the leading lights of the Asian hospitality, services and supplier sectors amid a who’s who guest list of ministers, VIP’s, dignitaries, celebrities and Asian restaurateurs and suppliers from across the UK. Following its inaugural ceremony in 2017 that was marked by a special message from HRH The Queen, AFRA 2018 recognised the achievements and contribution being made by South Asians in Britain.